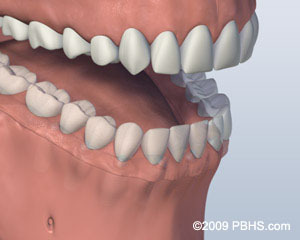 Fixed implant dentures, shown above, are also known as fixed hybrid prostheses, or fixed complete dentures. Four or more implants are placed in the upper or lower jaw, and a full set of replacement teeth is created which attaches to the implants by means of screws. In locations that are not visible, these screws actually pass through the prosthesis to engage the implants. Although a patient can’t take the teeth in and out, the prosthodontist can remove the restoration by loosening the retaining screws. This is important, since it makes long-term maintenance possible. In the above illustration from our practice, four implants have been used. This upper tooth replacement is made from porcelain bonded to a frame of high-strength zirconia ceramic. Zirconia ceramic is a more recent option for materials selection, desirable due to high strength and tooth-like color. Originally, frameworks were made from titanium, which is still widely used. Cobalt-chrome is another recent metal that has advantages. As you can see, there are a variety of design and materials choices. Before treatment, we will discuss the best option for your personal dental situation. To keep your mouth healthy and the tooth replacement in good condition, we recommend a personalized plan for regular check-ups. Fixed implant dentures, like the upper one shown above, are held in place by screws that secure them to the implants. They were originally designed to replace lower teeth, for people unable to function with regular lower dentures. This type of tooth replacement fits to the gum tissue in a way that allows you to clean under it with special dental floss. You can do with without removing the denture, which is never removed except during maintenance visits. The screw-retained denture CAN be removed by the dentist if there is an issue with one of the implants, or with the prosthesis itself. 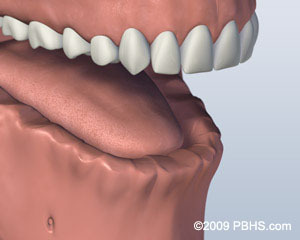 We call this “retrievability.” The illustration below shows the replacement of all lower natural teeth.